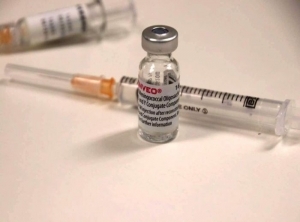 Nearly 90,000 young people have been vaccinated against the A, C, W and Y strains in just 11 weeks, Health Minister Michael Ferguson said on Thursday. However only 31 per cent of 20-year-olds have received a free jab, compared to around 94 per cent of 15-year-olds. All Tasmanians aged six weeks to 21 are eligible for a free vaccination against meningococcal A, C, W and Y under the expanded program, which was introduced in response to an outbreak of the W strain in the state's south. Mr Ferguson called the scheme "one of the most successful mass vaccination campaigns in Tasmania's history", as he encouraged older youths to take part. "We believe that the campaign will save Tasmanian lives, perhaps some have been saved from disease already," he said. "The free program is not over and I encourage the remaining Tasmanians who have not yet received their vaccination to do so." Tasmania has seen nine cases of meningococcal disease since July, including the death of a teenage girl that month.